Which Baccarat betting strategy offers the best results? Baccarat is one of the most popular table games, taking the third place, right behind roulette and blackjack. This card game can be played in land-based casinos and online casinos. In online casinos, players can choose between automated versions and live dealer casino versions of the game. Baccarat, also known as Punto Banco, is the most popular casino game in some parts of the world. Amongst Asian players, Baccarat is the most popular. Most of the gaming tables in Macau casinos consist of Baccarat tables, and also many of the real high rollers in Las Vegas play Baccarat. In the casino’s private salons, these high rollers play with bets that potentially amount to hundreds of thousands of dollars per turn. 1.1 Baccarat – why is Baccarat so popular? Baccarat is a very popular game in the Live Casino, where especially Evolution Gaming steals the show with different versions of Live Baccarat, including Speed Baccarat, Baccarat Squeeze and Tiger Dragon Baccarat. Baccarat is a fast casino game which requires no real strategy. You have to select one of three possible bets (excluding side bets), and the dealer will do the rest of the work. 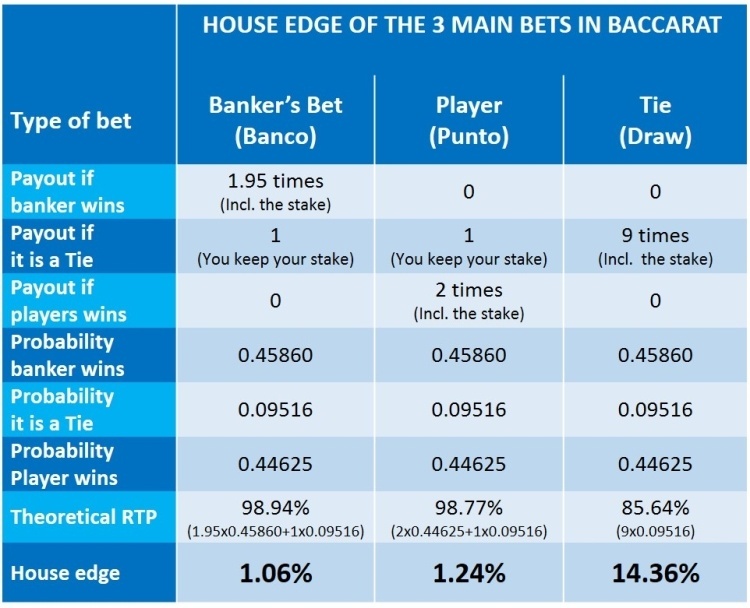 One huge advantage of playing Baccarat is the low house edge on the Punto and Banco bets: 1.24% and 1.06%, respectively. Why you should always avoid side bets. Last, but not least, we share what the best Baccarat strategies are, which help you make decisions to improve your winnings. 1.2 Why do you need a Baccarat Strategy? Do you, for example, increase your stake after you have lost? Alternatively, do you choose to do so, after you have won? The financial impact could be huge. How much am I prepared to stake (how high is my limit)? Which Baccarat strategy fits my playing style and personal goals the best? Especially the latter question is fascinating. There are many famous Baccarat betting strategies. Some of them are much better than others! 1.3 Which Baccarat strategy leads to the best results? Countless websites are boasting the best Baccarat betting strategies. Despite all this collective hype. the single most relevant question “which betting strategy generates the best results” is not answered by anybody. So, we have taken it upon ourselves to crack this nut for you. We carried out thousands of complex calculations with some spectacular results. It was not an easy or short task, but we did it. To be clear: NO Baccarat strategy will guarantee a profit. There is always a house edge for the casino, making it impossible to achieve gain from this game in the long run. However, there are some Baccarat strategies that give better results than other strategies. Again, all based on your profile and playing style. As is the case with any casino game, there are game rules. How do you play Baccarat? What kind of betting options does the game offer? What are the payouts per bet? 2.1 Baccarat – how does Baccarat work? Baccarat is a very straightforward game. You bet on who you think wins the next Baccarat game. After you place your bet, the game begins. Punto and Banco both get a pair of cards from the dealer. Dependent on the hand value (sum of the 2 cards) of both The Player and the Banker, a 3rd card is drawn for the Player and/or the Banker. This is done by the dealer, according to pre-defined rules. In the end, the side which is closest to a total hand value of 9 wins. In the case both sides have the same hand value, it is a Tie (a Draw). 2.2 What are the payouts at Baccarat for each of the 3 main bets? 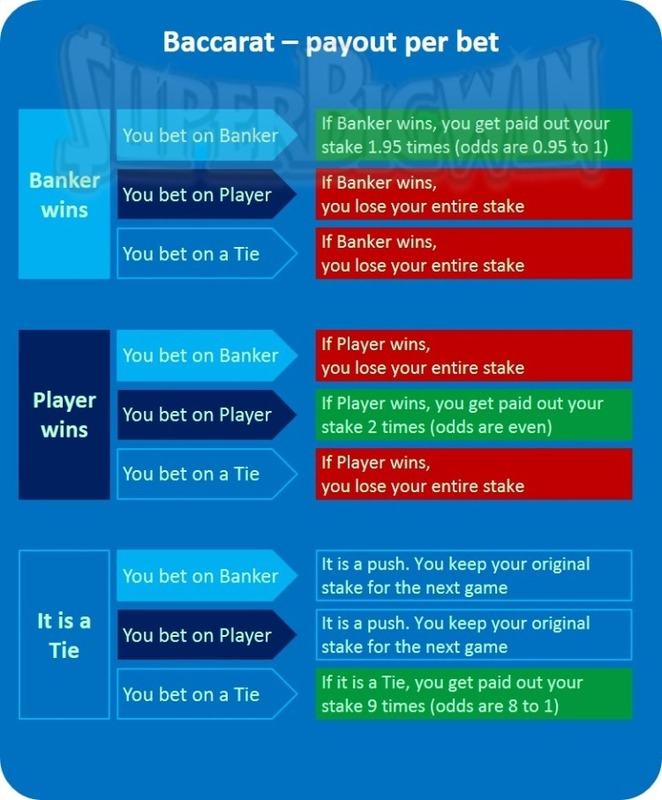 In the primary game, three possible outcomes are possible: the Player wins, the Banker wins, or it is a Tie (Draw). In case of a victory of the Bank, you get (only) 95% of your bet paid out as 5% commission is withheld. This 5% is the commission usually paid to online casinos in Baccarat. You pay this commission for a reason: the chance that the bank wins is the highest. If you put a bet on the Player or the Banker, it is a push. You do not win or lose. Your original stake is kept for the next game. 2.3 What is the house edge of the main bets at Baccarat? The probability of the Banker winning is 45.86%. The probability of the Player winning is 44.62%. The probability of a Tie is 9.51%. It is best to bet on the Banker winning the game. Even with the 5% commission, the Theoretical RTP (Return To Player) on this bet is the highest: 98.94%. This boils down to a house edge of only 1.06%. This makes the bank bet at Baccarat one of the very best bets in the online casino. Betting on Player results in a higher payout because you don’t pay 5% commission. The probability of winning is lower though. The Theoretical RTP of this bet is 98.76%, which brings the house edge to 1.24%. This is still an excellent percentage compared to many other casino games. What about the Tie bet? It’s better not to play this bet. 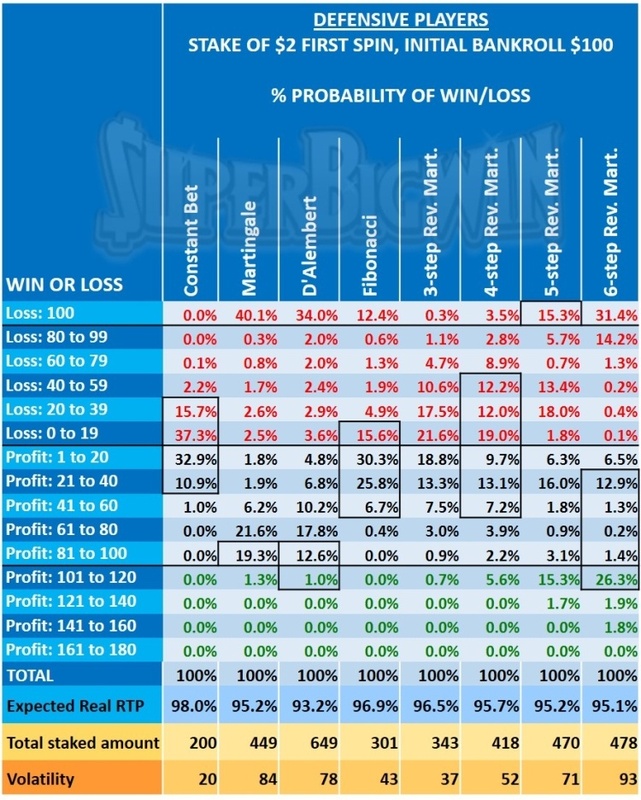 Although the profit is the highest (8 x the bet), the probability of a draw is by far the smallest. The house edge of the bank on the Tie bet is an astronomically high 14.36%. That comes down to a payout percentage (theoretical RTP) of, a meagre 85.64%. In some countries and/or online casinos, the Tie bet gives you a profit of 9 x the bet (you get paid out 10 times, including your stake), so the odds are more in your favour. The House Edge, in that case, is much better: 4,84%. This is pretty attractive, given that the variance of your winnings is much bigger. The calculations just shown, are based on a Baccarat game played with 8 decks of cards. This is done in the majority of online casinos as well as land-based casinos. The figures (percentages) are marginally different in the case fewer decks (usually 6 or 1 deck of cards) are used. 2.4 Are side bets a good bet at Baccarat? Are side bets a good bet at Baccarat? Side bets are typical “sucker bets”, intended to increase the house edge for the casino further. A side bet is an extra betting option; you can place in addition to the regular game. A side bet is placed on top of one of the 3 main bets (Player, Banker or Tie). There are many different types of side bets at Baccarat. All promise high payouts to entice you to place a bet, but the payout percentage is low. Perfect pair: both Player and Bank are dealt with the same cards (in value and colour). This gets you 25 x the bet for one pair and 200 x your bet for two pairs. The payout percentages for these side bets range from 86.29% for Either pair to 91.95% for Perfect Pair. If we convert that to the house edge, you arrive at percentages of 8.05% to 13.71%. They call these types of bets “Sucker Bets” for a reason. It’s better to avoid side bets like these. 3 How do you play Baccarat? First, you decide your bet size and on which type of bet you want to place your stake: Punto, Banco or Tie. If you place a bet on one of the three bets, you may also place a side bet. You are not allowed to just place a side bet (not that you would want to, anyway). The dealer deals two cards to both the Player (Punto) and the Banker (Banco). The value of the 2 cards is added. If the total value is a single digit number, then that is the value. If the total value is a double-digit number, the left digit is removed, so that a single digit is left. 6 and King: The total value of this hand is 6 + 0 = 6. 6 and 7: The total value of this hand is 6 + 7 = 13. As it is a double digit, the 1 is removed. The value becomes 3. 6 and Ace: The total value of this hand is 6 + 1 = 7. 8 and 2: The total value of this hand is 8 + 2 = 10. As it is a double digit, the 1 is removed. The value becomes 0. 10 and Queen: The total value of this hand is 0 + 0 = 0. Next, the fixed house rules apply concerning buying a 3rd card for both the Player and the Banker. This means that the Player is dealt an extra card if the Player has a value of 0 to 5 points in total. Whether the bank receives an extra card depends on two things: the total points of the Bank itself and the total points of the Player. The 3rd card rules and their explanation is provided in more detail below. It is not necessary to learn these rules by heart. These rules are applied by the dealer and are applied automatically. You have no choice in whether to draw a 3rd card or not, contrary to the Blackjack game. 3.1 How does the Player’s 3rd -card-rule work in Baccarat? If either the Player or the Banker has a total of 8 or 9 on the first two cards no further cards are drawn. The resulting hand is called a “natural”, and the hand is over. If the Player’s total is less than or equal to 5, the Player’s hand always draws the 3rd card. 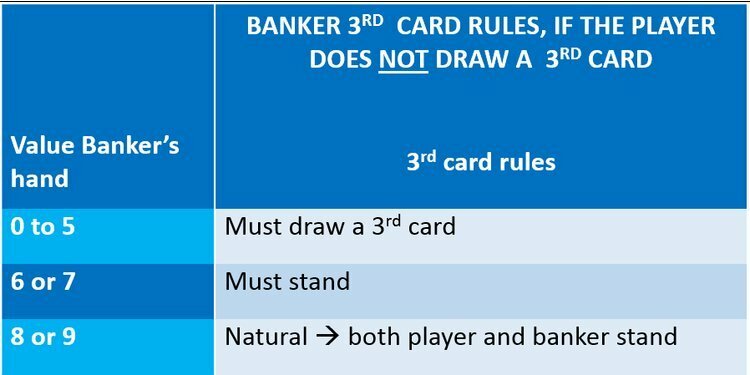 3.2.1 Banker’s 3rd -card-rule – if the player does not draw a 3rd card. needs to draw a 3rd card if the player’s total is of 5 or less. 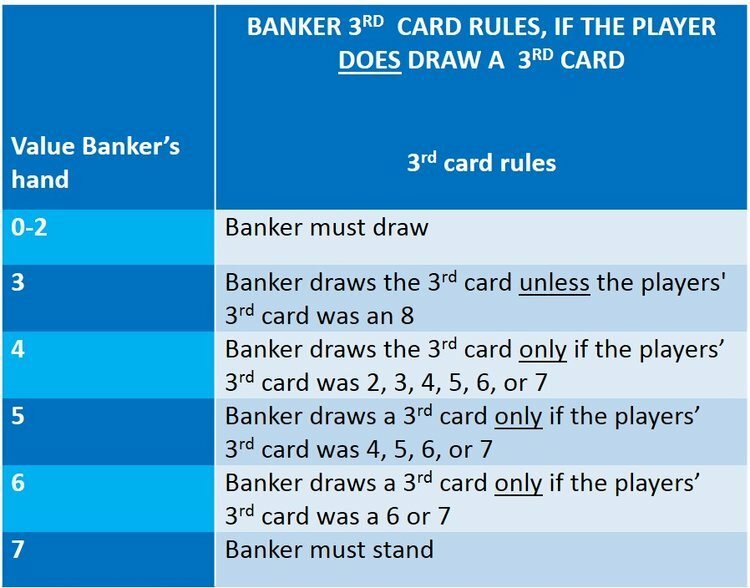 If the player does draw a 3rd card then the Bank’s 3rd -card-rule below determines if the bank takes a 3rd card or not. If the bank’s total is 2 or less, then the bank draws a card, regardless of what the players’ 3rd card is. 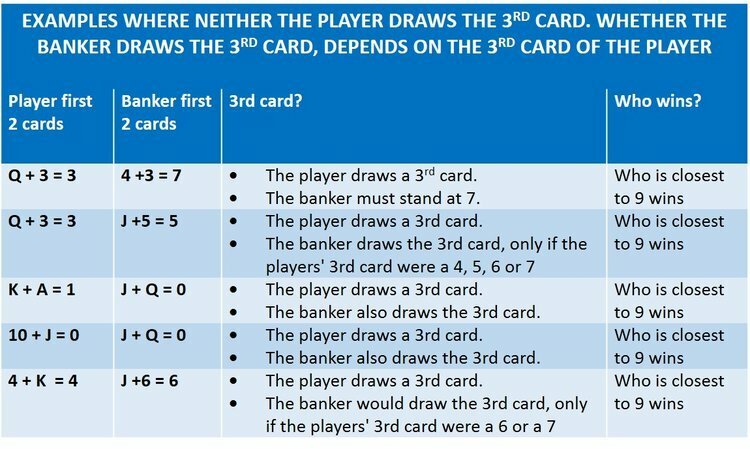 If the banks total is 3, then the bank draws a 3rd card unless the players’ 3rd card was an 8. If the banks total is 4, then the bank draws a 3rd card unless the players’ 3rd card was a 0, 1, 8, or 9. If the banks total is 5, then the bank draws a 3rd card if the players’ 3rd card was 4, 5, 6, or 7. 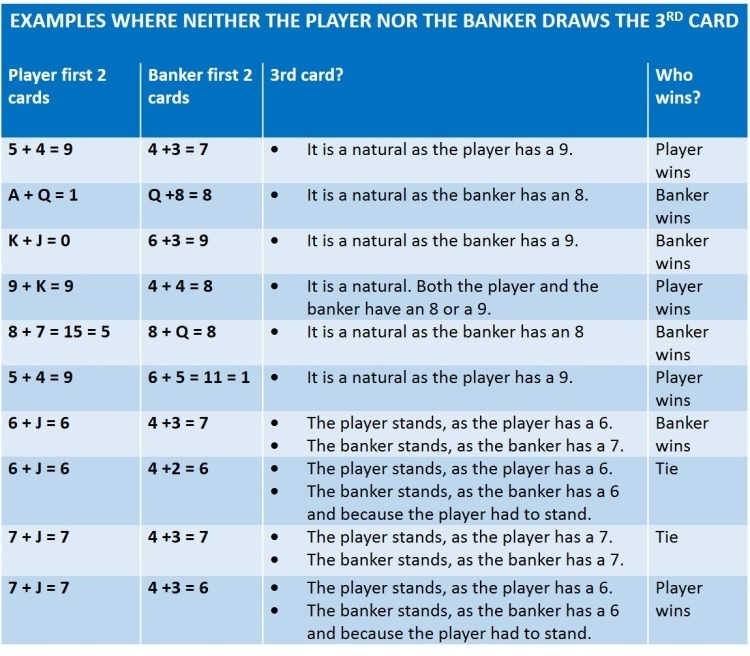 If the banks total is 6, then the bank draws a 3rd card if the players’ 3rd card was a 6 or 7. If the banks total is 7, then the bank stands. 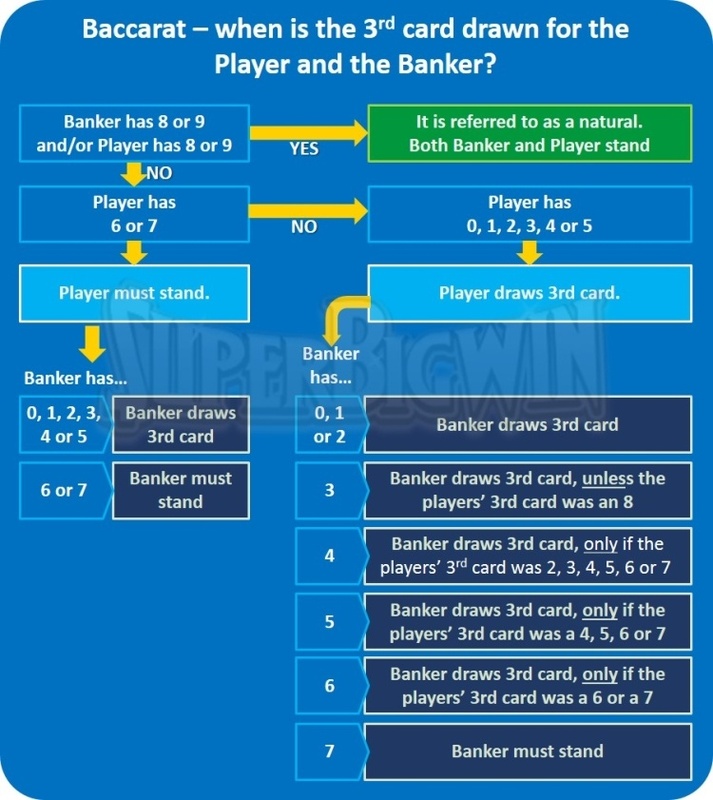 The illustration below shows how the player’s 3rd card rule and the banker’s 3rd card rule work. Below you see some instances, where neither the Player nor the Banker draws a 3rd card. Below you see some examples, where the Player does not draw a 3rd card, but where the banker does. Now, we get to the good stuff. Let’s talk about which Baccarat strategies will give you the best chance of winning, based on your playing profile. A recreational Baccarat player might want to apply a completely different approach to this game than a seasoned, high stakes Baccarat player. 4.1 Is there a strategy you can use with Baccarat? The answer is yes! There are many strategic decisions for you to make in Baccarat. As simple as these are, they help you in getting better results. Or at least, avoid you making wrong decisions that can be too costly. There are 3 types of strategic decisions players make. STRATEGIC DECISION 1 – GAME TACTICS: Which tactics do you need during the game, if any. When do you have to draw a card or not? STRATEGIC DECISION 2 – WHICH TYPES OF BETS: Which bet types are the most attractive? Which bets do you need to avoid? STRATEGIC DECISION 3 – BETTING STRATEGY: Which betting sequence yields the best results for you? Do you need to increase your stake after a loss? Alternatively, do you increase your stake, following a win? Alternatively, you may keep your stakes constant during the session. There are many well-known betting sequences such as the Martingale betting strategy, the Reverse Martingale betting strategy or the Fibonacci betting strategy? Which one suits best? 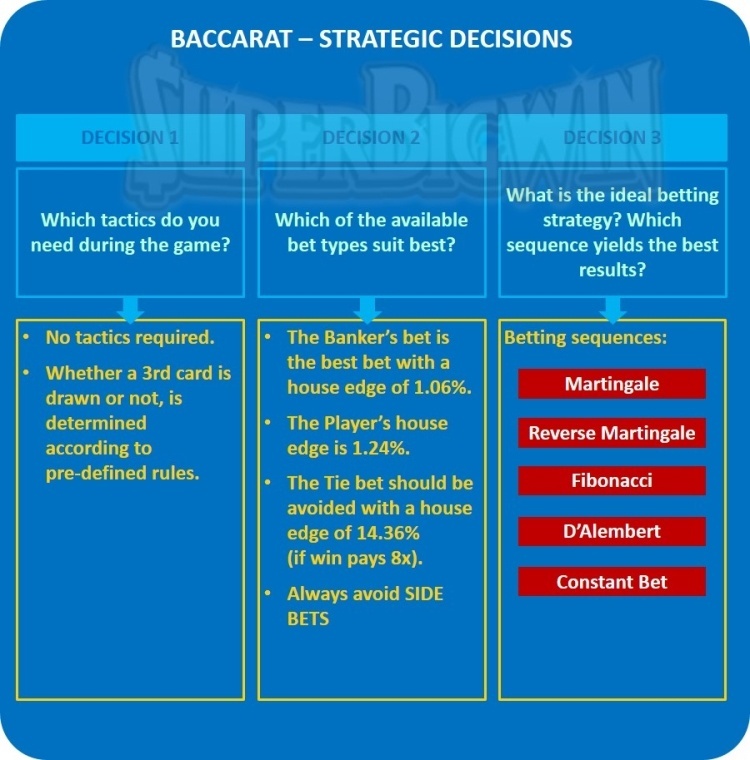 4.2 STRATEGIC DECISION 1: Which tactics do you need during the Baccarat game. When do I have to draw a card or not? Having a tactical game plan during the Baccarat game is not required. Baccarat is a game where the dealer deals cards with pre-defined rules. You don’t need to learn these rules. The dealer takes care of this. 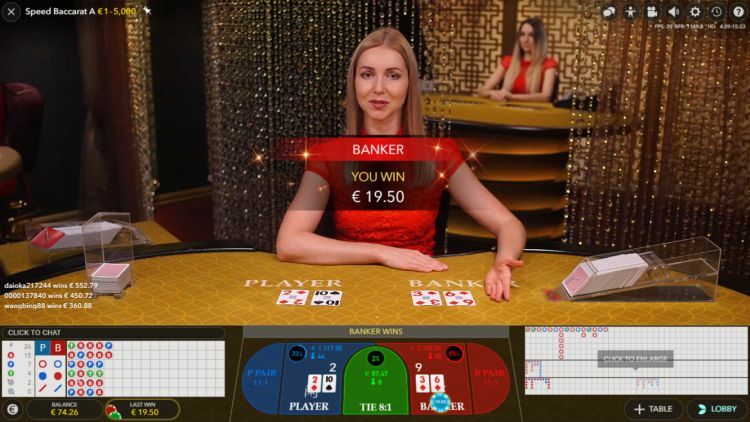 Unlike games such as Blackjack, where you decide if you want to stand or draw the next card, you do not need to decide this if you play Baccarat. 4.3 STRATEGIC DECISION 2: Which bet types are the most attractive? Which bets do should be avoided? Which bet do I play? The Banker’s bet, the Player’s bet or the Tie bet? Alternatively, any of the side bets? At some casinos, the house edge of the Tie bet is 4.84% (in the case the profit is 9x your bet, and the payout, including your original stake, is 9x your bet). We therefore always recommend you to play the Banker’s bet or the Player’s bet. The differences in the house edge of both bets are minor. The Player bet is more practical, as your profits exactly match your initial stake. At the Banker’s bet, you pay 5% commission. This implies that you need to bet in multiples of $20 at land-based casinos. If you wager high volumes, the differences can be a bit more substantial. In that case, we always recommend the Banker’s bet over the Player’s bet. The tie bet should not be played if the profit amounts to 8x the original stake, as in most casinos. If you find a casino where the profit is equal to 9x your original stake, the house edge is reduced to 4.84% which is pretty attractive. The advantage of the Tie bet is that you can win more substantial amounts more quickly (higher variance of potential profits). Side bets should ALWAYS be avoided, as the house edge is much too high for these bets. 4.4 STRATEGIC DECISION 3: Which betting sequence yields the best results? There are many betting strategies around that are suitable for Baccarat. The way you manage your stakes has a significant impact on the outcomes. Do you need to increase your stake after a loss? Alternatively, do you increase your stake, following a win? Alternatively, you may keep your stakes constant during the session. Do you choose to bet a progressive pattern? Alternatively, do you prefer a more defensive approach? There are many well-known betting sequences such as the Martingale betting strategy, the Reverse Martingale betting strategy or the Fibonacci betting strategy? Which betting sequence yields the best results for you? How much am I prepared to stake at the maximum (how high is my limit)? How many winnings do I aim for? After which level of profits shall I stop playing? 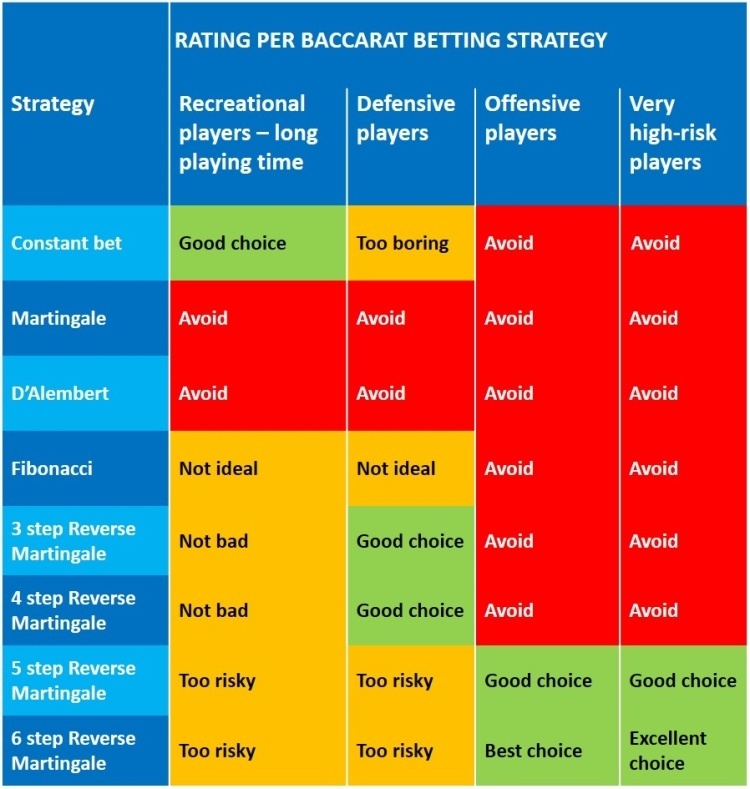 Which Baccarat betting strategy fits best? Especially the latter question is fascinating. Our calculations show that the ideal Baccarat betting strategy depends strongly on your ambition level. As a result, defensive players need a different Baccarat betting strategy than offensive players. We understand every Baccarat player is different and you might have different goals. However, for the sake of continuity, we must make some assumptions. Several, well known, and often used Baccarat strategies can lead to unnecessary losses when used by players with a profile that is not suited to that particular Roulette strategy. Furthermore, some Baccarat strategies are just a bad choice for any player, be it an offensive or a defensive player. These are the most common and best-known Baccarat strategies. These strategies are all so-called “even bet” strategies. The Constant Bet strategy is straightforward. Another pro is that it is not so progressive. Our extensive calculations show that this strategy is ideal for recreational, conservative or defensive players who choose to limit the risk and extend the playing time. 7 Measurement criteria: How do you decide which betting strategies are the best? Especially the latter one (Probability Tables) is remarkably interesting and gives you much more relevant information. For example, if the House Edge is 2%, for every staked $100, the casino earns $2 and pays out $98 on average (in the longer run). • The House Edge of 2% is the profit margin which casinos earn in the longer run. It is the betting margin that players lose on average. • On average you get paid out 98% of your staked amount. It is also called the Theoretical Return to Player (Theoretical RTP). Why does this happen, if the House Edge is, say 2%? This is because you have staked much more than the $100 you brought with you. • Over the whole session, you stake $3000. • The expected casino profit (ON AVERAGE) amounts to 2% multiplied by $3000 = $60. • The amount paid back (ON AVERAGE) is $2940. • The casino’s House Edge is 2% ($60 over the total amount staked $3000). • The Casino Hold in this example is 60% ($60 of $100 which was your bankroll). 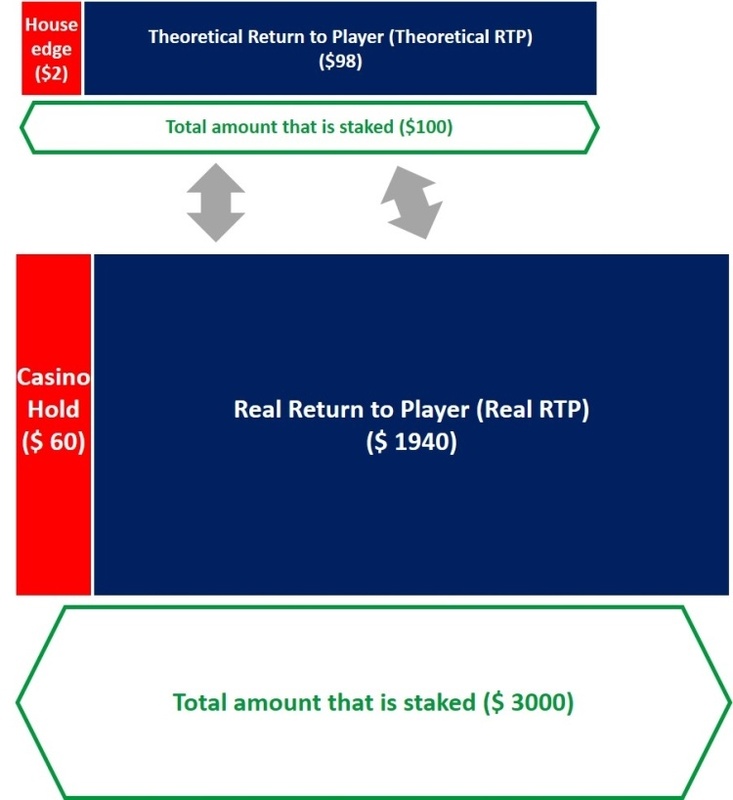 • The Real Return to Player (Real RTP) in this example, is a mere 40% of the $100. The example shows us that it is best to stake as little as possible. For example, by finding a strategy where $300 is staked instead of $3,000. The volatility (as a measure of the variance) is an indication of how widespread potential winnings or losses are. The table below provides some examples. The more risk you take, the more volatility you seek. Defensive players like to have moderate volatility. For example, they are satisfied with $50 profits. At the same time, they aim to avoid losing the entire initial stake ($100). There are also many offensive (risk-taking players) who prefer higher game volatility. They are keen to take a shot in winning $1000 or even more, while they only have an initial bankroll of $100. 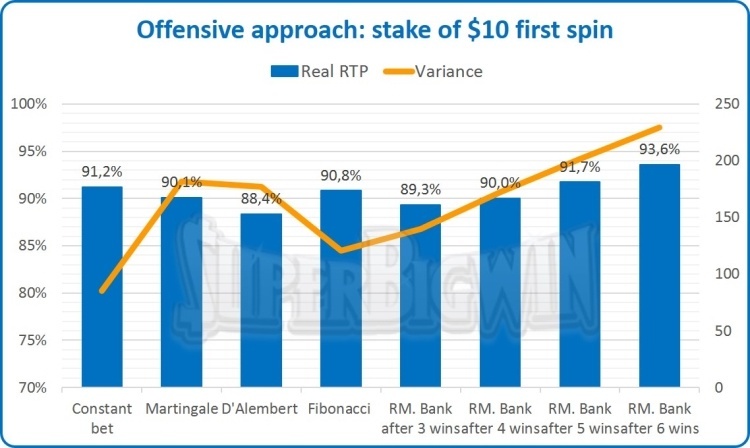 If it is easy for you to afford to lose the entire initial deposit (of say $100), it makes more sense to opt for a higher variance strategy which leads to potential higher winnings. If you need to keep some extra cash and cannot afford to lose your initial stake of $100, we strongly recommend you to choose a more cautious (defensive) strategy with low variance. The upwards potential is much less in that case. • Defensive players aim for a volatility of around 25-50. • Offensive players typically would like to have a volatility of 100-200. • Slot players aim for a volatility in the range of 400-2000. • If you play a lottery with a high jackpot, you aim to win it and know that the probability in doing so is almost zero. The volatility of a lottery could be as high as 10000. The example below shows that it is only part of the story. Would you, for example, not be interested to know your chances, of making a large profit? Alternatively, the probability that you leave the session empty-handed? It is best explained with the example below. Your starting amount is $100. • A cautious strategy: you are not keen to take too much risk. • A risky strategy: you like to take some risk, but not too much. • A very risky strategy: you are comfortable to take a lot of risks. Below, as an example, you find out the probability table of each of the 3 strategies. 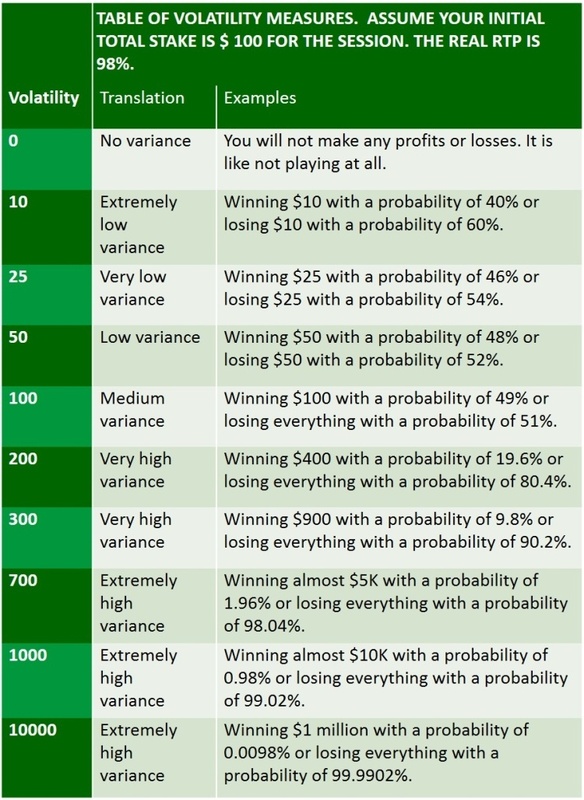 Here, probabilities are assigned to your clusters of losses and wins. All 3 strategies have the same Real RTP of 98% (House Edge of 2%). But the outcomes are very different. In the cautious strategy, the probability of losing $50 (out of your initial stake of $100) is 52%, whereas the probability of winning $50 is equal to 48%. In the middle strategy, you see that you have a 9% chance of losing your entire bankroll ($100). The probability of losing $50 is 60%. On the other hand, you have a 20% chance of winning $50, 4% of winning $100, 4% of winning $200 and 3% of winning $500. 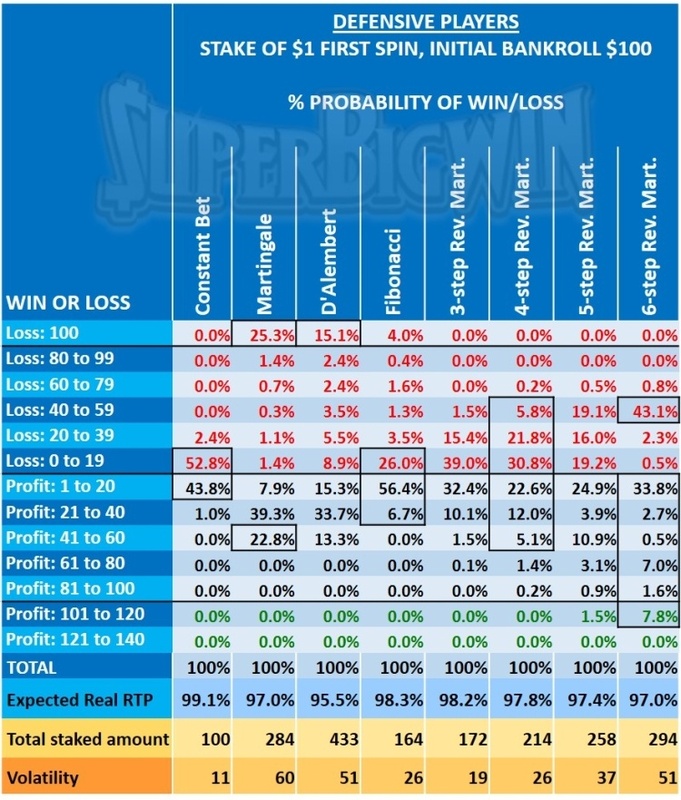 In the riskiest strategy, you have a vast probability of 84% of losing everything (your initial bankroll of $100) and a 16% chance of winning a huge $500. This example shows that this additional information is very relevant when you select your preferred strategy: looking at the Real RTP is only part of the story. Your obvious question now is: where do I find these probability tables? The answer is simple: we have calculated these for you. Check our unique Roulette strategy article for extensive probability calculations for 8 of the most popular Roulette strategies. 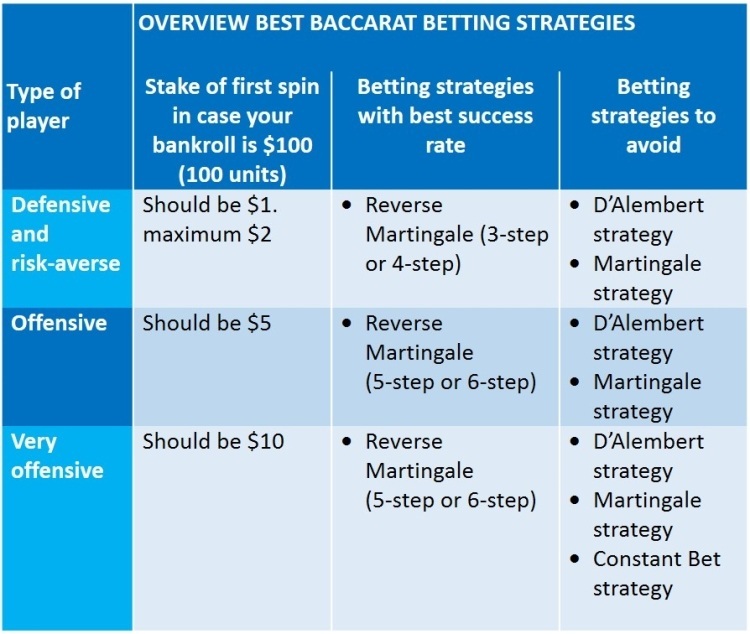 8 STEP 2: Which Baccarat betting strategy works best for defensive players? If you are a defensive player, some Baccarat strategies work better than other strategies. Before we can start doing our calculations, we have to set some rules. The stake is $1 on the first round. We have calculated (with the random generator of 1 million Roulette sessions) the probability of obtaining a certain amount of winnings (or losses). 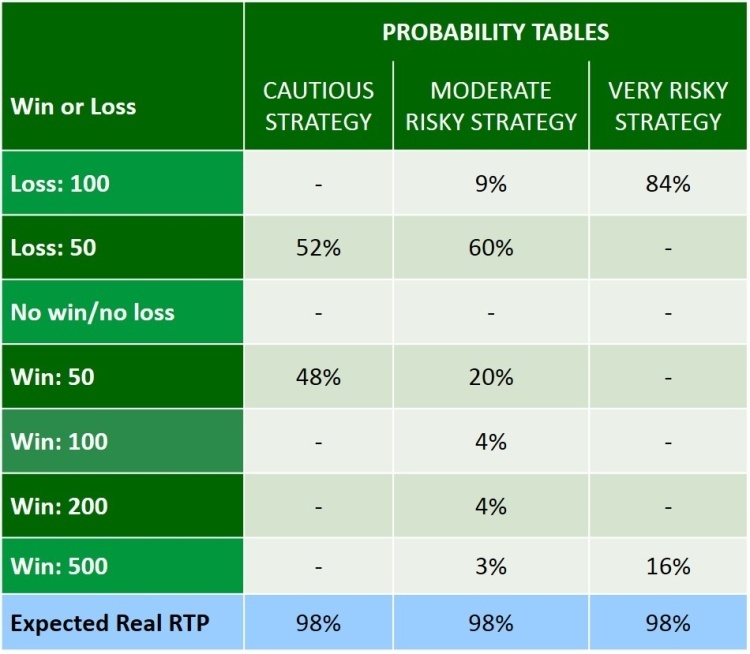 The Constant Bet strategy has the highest Real RTP (99.1%). The volatility (the measure of variance) is very low though. You end up (most likely) with a tiny loss or a very moderate win. The probability of winning anything between 1 and 20 is 43.8%. The probability of winning anything more than 20 is only 1% and winning anything over 40 is zero. It is the ideal strategy if you seek entertainment: perfect for recreational and cautious players. If you are a more aggressive player, it is not the preferred strategy: the upside potential is minimal. The Martingale strategy is defensive and prudent, right? Not. The chance of losing everything is 25.3%. 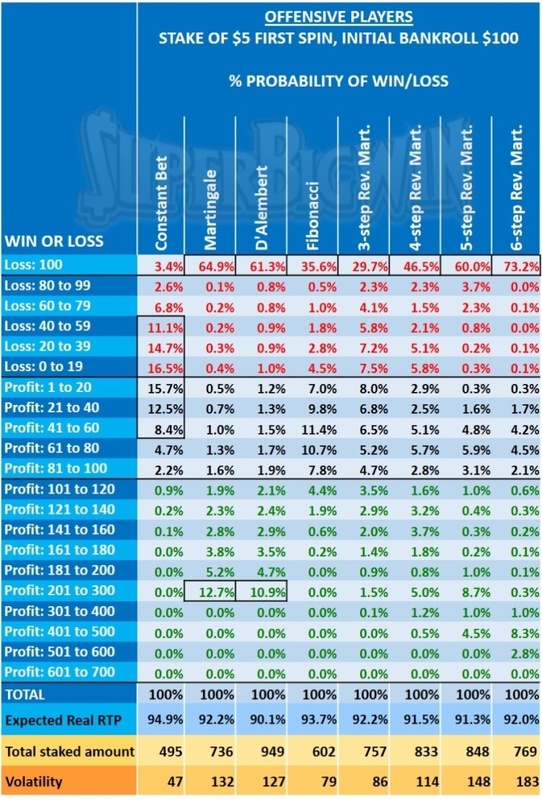 The likelihood is of making a profit is 70% (7.9%+39.3%+22.8%). The Martingale strategy has the highest variance. The D’Alembert strategy is also pretty aggressive. The probability is 15.1% that you leave empty-handed. It becomes progressive as the stakes increase over time. The result is that you get high losses. The Real RTP is the lowest with only 95.5%. We do not recommend this strategy. The Reverse Martingale strategies are interesting. 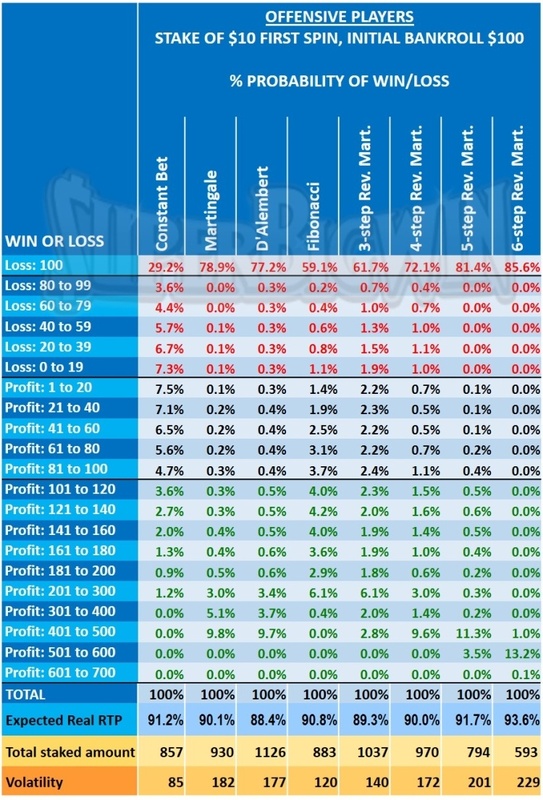 These, strategies (especially those where you bank after 5 or 6 consecutive wins) have an excellent upwards potential (the chance that you win more than $100 is 7.8%). In the worst case, your losses amount to $60. So still enough money left to take a taxi home. 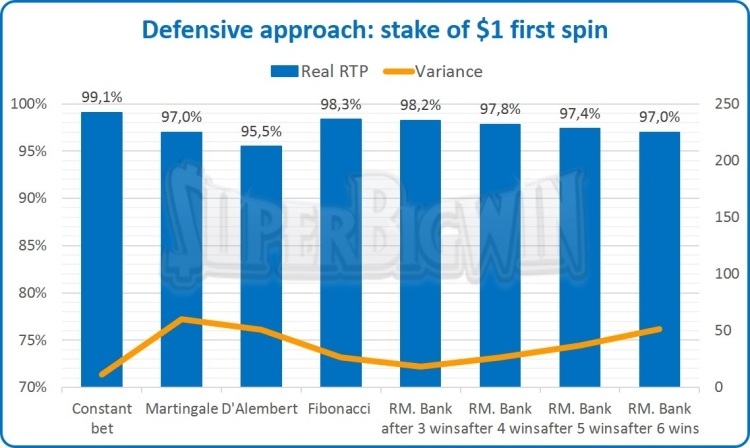 What makes Baccarat so appealing is that the Real RTP’s are still very attractive (all higher than 97%, with the exception of the D’Alembert betting sequence). This is explained by the very low house edge of only 1.06%. The picture here is very similar to the results of our first test (with a stake of $1 on the first round). The Martingale and D’Alembert strategy have a very significant probability of you ending up with zero (40.1% and 34.0% respectively). Besides, these strategies have the lowest Real RTP. The Constant Bet strategy has the highest Real RTP and the lowest volatility (variance). It is not possible to win anything significant when you follow this betting strategy. The Reverse Martingale strategies are appealing: the chances of you leaving empty-handed are small (unless you opt for the 5-step or 6-step Reverse Martingale). The upwards potential is pretty significant. 8.4 Which even bet Baccarat strategies are the best for defensive players? As you are defensive, we recommend you to have an initial stake of $1 maximum $2 (if your entire wallet amounts to $100 at the start). The Real RTP’s are better for the strategies where you bet $1 on your initial stake. 8.5 Which even bet Baccarat strategies are the worst for defensive players? These strategies have a high chance of you leaving the casino empty handed. The real RTP of these strategies is also the lowest. 9 STEP 2: Which Baccarat betting strategy works best for offensive players? If you are an offensive player, some Baccarat strategies work better than other approaches. Before we can start doing our calculations, we have to set some rules. We have selected 8 betting strategies for even bets to start with. The Martingale and D’Alembert strategy have a significant probability of you ending with zero: probabilities of 64.9% and 61.3%). Chances of getting a profit higher than $300 are minimal. 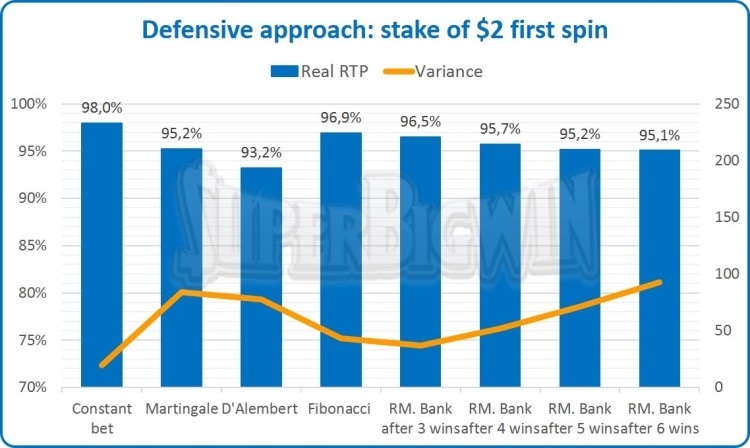 The Real RTP’s are 92.2% for the Martingale Strategy and a pathetic 90.1% for the D’Alembert strategy. These strategies are not our preferred choice. Instead, we recommend the 5-step of the 6-step Reverse Martingale strategies. Whereas the real RTP’s are not much higher than that of the Martingale strategy, there is much more upwards potential. There is a fair chance that you can win more than $400, which is the target you are aiming for. There is one real exception. 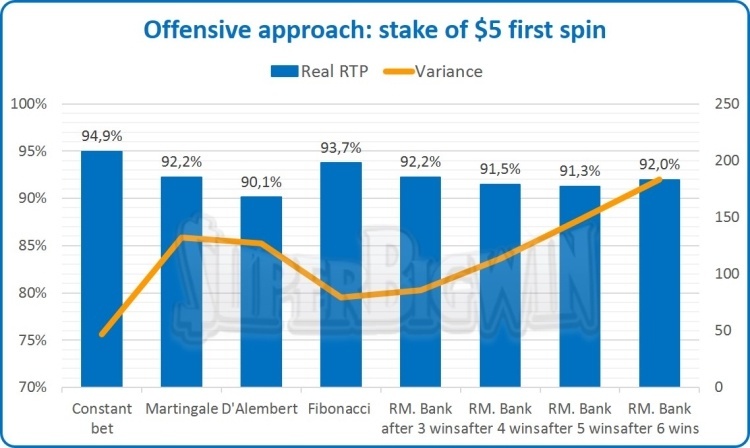 Looking at the 6-step Reverse Martingale strategy (banking after 6 consecutive wins), you see that the Real RTP is 93.6%, which is significantly higher than all the other Baccarat betting strategies. You have a fair chance of 14.3% (1.0%+13.2% + 0.1%) of getting yourself a profit of $400 or more. The downside is that the probability is 85.6% that you end up with nothing. This strategy works great if you seek a high profit, especially compared to the other strategies. 9.4 Which even bet Baccarat strategies are the best for offensive players? We conclude that the 6-step Reverse Martingale strategy is the best betting strategy for you, assuming you are a risk taker. 9.5 Which even bet Baccarat strategies are the worst for offensive players? The Fibonacci strategy does not work well with stakes of $10 and is just not progressive enough. 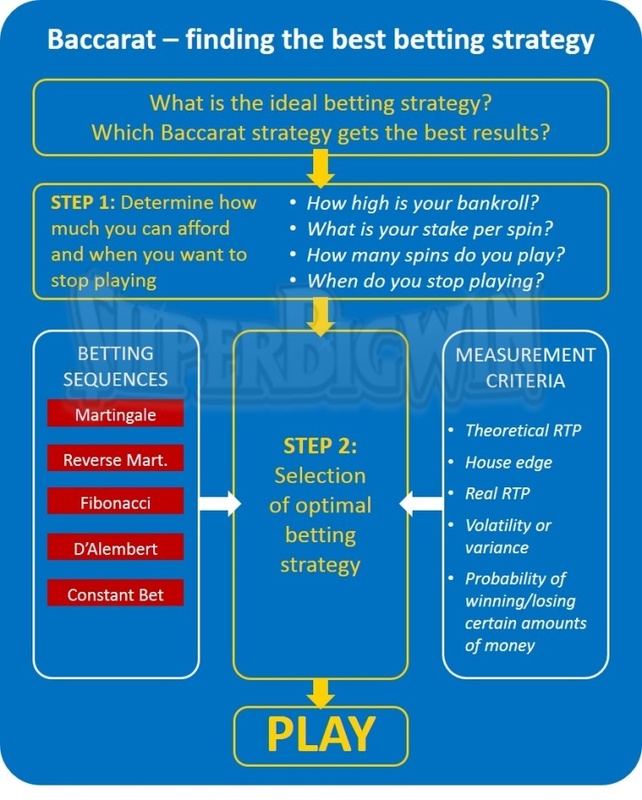 10 STEP 2: Summary – which Baccarat betting strategies have the best results? If you have made it this far: this is the part where we give an overview of which Baccarat betting strategies provide the best results. Or, in other words: which Baccarat strategy is most suitable for what type of player? We conclude that defensive and risk-averse players are also best off with the Reverse Martingale strategy (3-step or 4-step). The Constant bet strategy (always the same stake on even bets) is not volatile enough and does never lead to the desired level of winnings. But it is not the worst strategy. Theoretically, the Martingale strategy works, but not in practice! It only works in a hypothetical world where you have an unlimited bankroll and where casinos do not impose limits and players have unlimited bankrolls.